The Xiaomi Redmi Note 7 is expected to launch in India next week. 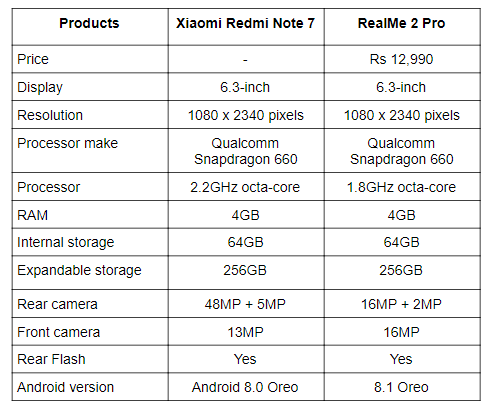 We are comparing the device with the RealMe 2 Pro. The comparison is based on specifications, features, and price. The Xiaomi Redmi Note 7 is the first smartphone by the Chinese company that has a 48MP sensor on the back. The phone is expected to come under Rs 10,000. However, nothing has been confirmed by the company yet. It has a 6.3-inch display that has a dew-drop notch on top of it. On the other hand, we have the RealMe 2 Pro, which was one of the popular mid-range segment devices of the last year that features a 6.3-inch display with a dew-drop notch, same as the Xiaomi Redmi Note 7. So, let’s begin with a quick specs comparison to see which device packs more powerful hardware at least on paper. Both the smartphones sports a 6.3-inch FHD+ display that offers a resolution of 2340 x 1080 pixels. 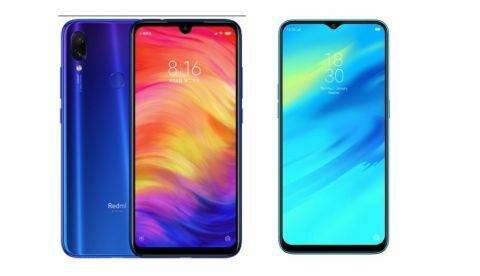 Both Xiaomi Redmi Note 7 and the RealMe 2 Pro has a tiny notch on top of it, which houses the front-facing camera. When it comes to the processor, both the device is powered by a Qualcomm Snapdragon 660 processor. The RealMe 2 Pro is available in two variants in India 4GB/64GB and 6GB/64GB storage models. On the other hand, the Xiaomi Redmi Note 7 is expected to launch in 4GB/64GB model. As far as the cameras are concerned, one of the main highlights of the Xiaomi Redmi Note 7 is its 48MP rear camera that is coupled with a 5MP unit. On the other side, the RealMe 2 Pro is equipped with a dual 16MP + 2MP camera setup on the back along with a 16MP sensor on the front. The RealMe 2 Pro 4GB/64GB variant is available in India for Rs 12,999, while the Xiaomi Redmi Note 7 is expected to launch in India next week.